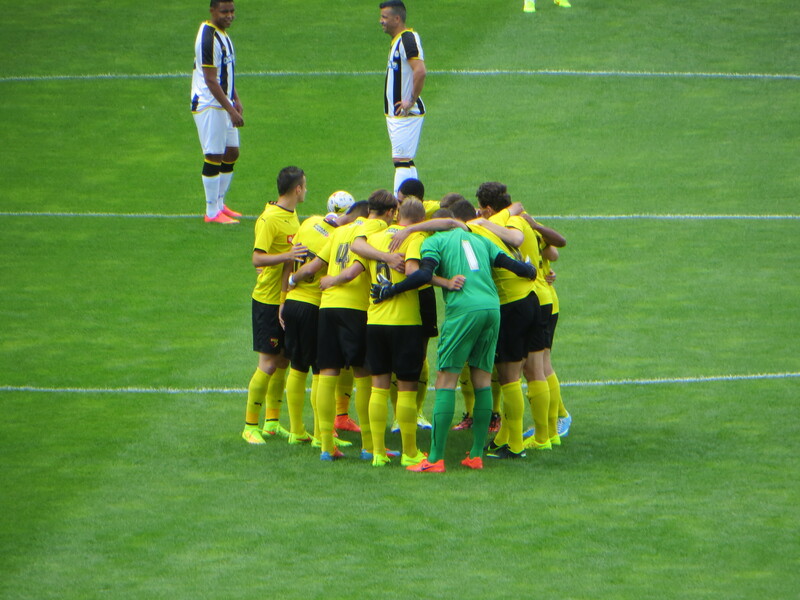 Saturday saw the long-awaited visit of Udinese to Vicarage Road. But, before that, was the joy of our first pre-match gathering of the new season. Time to catch up on what people had been doing during the Summer and to speculate on the season to come. Then it was off to Vicarage Road to see what changes had occurred since our last visit (most of which were additions to the new stand and the squad). When the starting line-up came through, it appeared a bit odd, mainly because Beppe had abandoned the 4-3-3 that we’ve seen for most of the pre-season to revert to 3-5-2. But also because some of the standout players in pre-season so far were left on the bench. We started with Gomes, Angella, Tamas, Ekstrand, Pudil, McGugan, Andrews, Abdi, Anya, Deeney and Vydra. Udinese’s team featured Watford old boy, Albert Riera, as well as Di Natale, much to the excitement of the Vicarage Road crowd. It has to be said that, given the popularity of the new away shirt, it was very difficult to distinguish the Watford fans in the crowd from those from Udinese. The first attempt on goal from either side was a weak shot from Fernandes that drifted over the bar. A free-kick soon after was easily gathered by Gomes. We had to wait until the 18th minute for Watford’s first attack of note as McGugan fed Vydra who played a through ball to Anya but the Scot’s first touch was too heavy and Brkic gathered safely. The visitors threatened as a shot from Fernandes rebounded off the crossbar and Di Natale’s follow-up was gathered by Gomes. 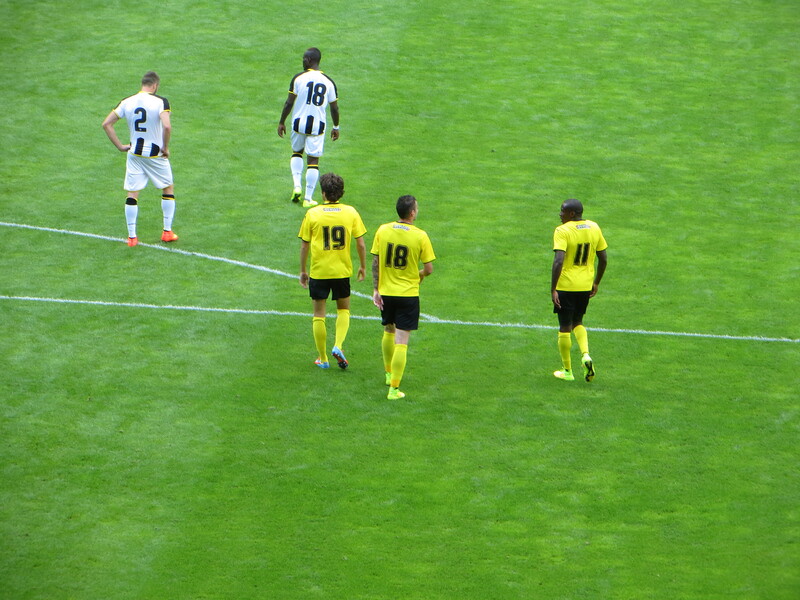 On 23 minutes, Udinese went ahead as Widmer nodded a cross past Gomes. I was a little surprised by the warmth of the applause that this elicited from the Watford fans. The ironic chants of “sign him up” were less surprising. We had a chance to hit back almost immediately as Vydra won a free-kick, but McGugan floated it into the arms of Brkic. On the half hour, Adbi found Deeney who turned and shot but the ball looped into the keeper’s arms. Di Natale looked to break into the box but Ekstrand was on hand to stop him. At the other end, the ball was taken off Vydra’s feet on the edge of the box. A defensive header from Deeney in our box reached McGugan who played a through ball to Anya to set up a counter attack, but the ball was too far in front of him and the chance lost. In the dying minutes of the half, McGugan played a ball across the box to Pudil who cut back to Deeney whose shot was blocked. On the stroke of half-time, Tamas gave the ball away to Fernandes but, thankfully, his shot was caught by Gomes so we went into the break just one goal down. It has to be said that the first half had been rather lack lustre. There were no personnel changes at half-time and we started the second half brightly as Anya went on a run down the right and pulled the ball back for the strikers but it rolled behind both Deeney and Vydra, so was left to Pudil to run in and unleash a shot that was deflected over. The subsequent corner was punched clear by Brkic. At the other end, Di Natale tried a shot but it was well off target. A corner from McGugan was cleared with Angella challenging, it reached Ekstrand who wellied his shot over. We should have equalized on 50 minutes as Deeney knocked the ball down to McGugan whose shot flew just wide. A stinging shot from distance from Muriel was parried by Gomes. On 58 minutes, Watford equalized. 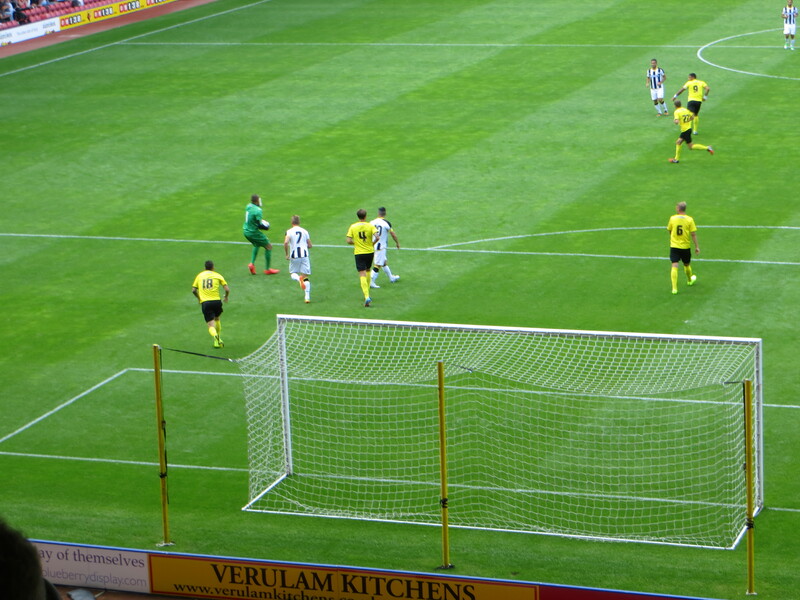 Vydra was taken down and McGugan stepped up to take the free kick and curled it perfectly into the top corner. 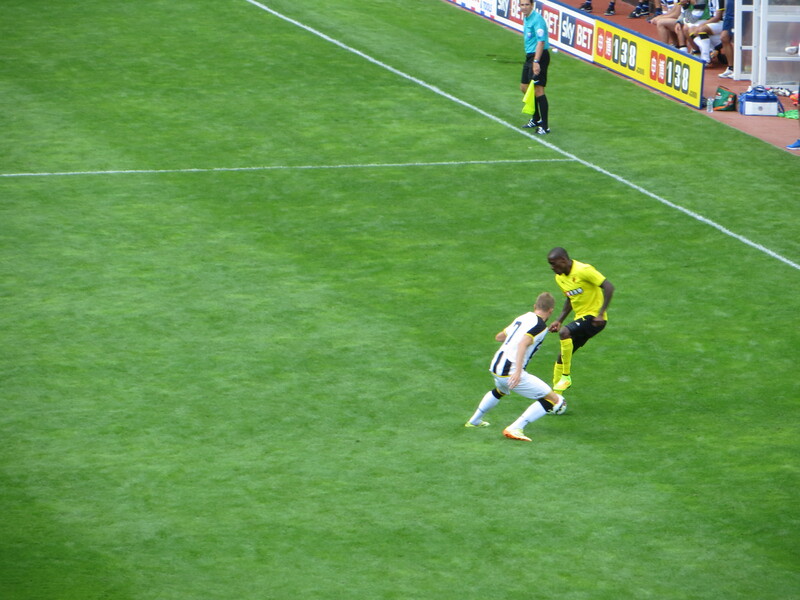 That was his last involvement, as he was replaced by Battocchio, while Dyer and Ighalo came on for Anya and Vydra. The subs were involved almost immediately as Battocchio found Deeney who passed across to Ighalo whose shot sadly hit the side netting. At this point, Riera was replaced by Silva and left the field to very warm applause from the Watford faithful. Deeney also left the field to be replaced by Ranegie. Muriel went down injured and was replaced by Thereau. At the same time Udinese swapped keepers with Scuffet coming on for Brkic. At this point there was a delay in proceedings as Muriel was still down injured, but the ref finally stepped in and dragged him from the pitch by his arm to the sidelines where he was “looked after” by Harry Hornet. I almost felt sorry for the guy. Fernandes curled a shot from distance just wide of the near post. Watford went behind again as Ranegie lost out to Allan who played a through ball to the substitute, Thereau, who fired a shot across Gomes into the far corner. With 15 minutes remaining, Hoban and Fabbrini replaced Tamas and Abdi. The next piece of skill was in the home dugout as a ball flew in and was controlled and returned to the field by Forestieri, who gloried in the cheers from the crowd. Watford drew level again as Fabbrini went on a run down the left and crossed for Pudil whose header looked as though it was on target but Ranegie nodded it on, just in case, with Scuffet appealing for offside. That was Pudil’s last contribution as he was replaced by Doyley. We had a great chance to win the game as Scuffet came out to meet Ranegie who dinked the ball past the keeper and crossed back for Ighalo, but the Nigerian was unable to reach the ball and, with the goal begging, the chance was lost. It had been a more enjoyable second half and a draw was a decent result against our Italian brothers. But I left Vicarage Road with little idea of what our starting line-up or formation will be next week. However, on a positive note, well done to the club for the pricing of this game, my ticket was £3 in contrast to the £14 asked for the Coventry game at Boreham Wood. 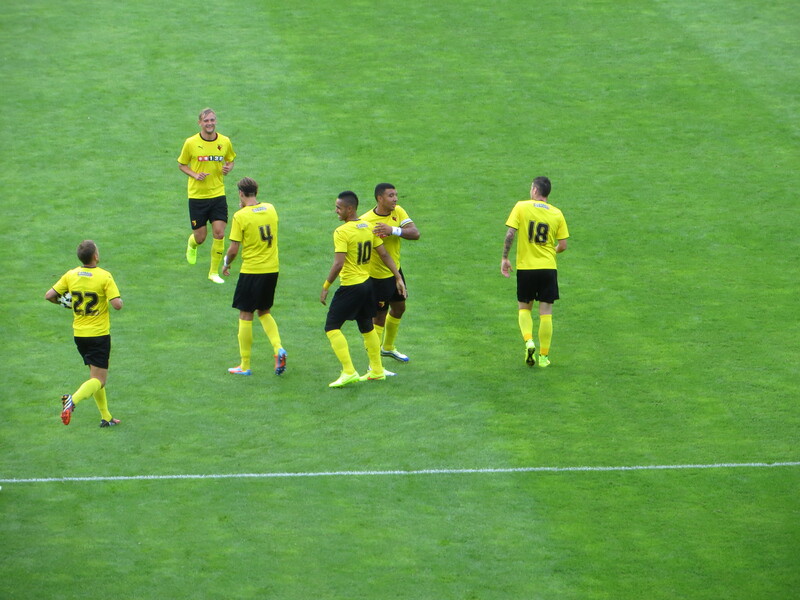 This encouraged a crowd of 11,085 into Vicarage Road, a very impressive attendance at a pre-season friendly. Now bring on the Bolton. This entry was posted in Watford FC and tagged Albert Riera, Almen Abdi, Antonio Di Natale, Beppe Sannino, Bruno Fernandes, Cristian Battocchio, Cyril Thereau, Daniel Pudil, Danilo, Diego Fabbrini, Emmanuel Agyemang-Badu, Gabriel Silva, Gabriel Tamas, Gabriele Angella, Giampiero Pinzi, Guilherme, Heurelho Gomes, Ikechi Anya, Joel Ekstrand, Keith Andrews, Lewis McGugan, Lloyd Doyley, LLoyd Dyer, Luis Muriel, Matej Vydra, Mathias Ranegie, Maurizio Domizzi, Nicolas Lopez, Odion Ighalo, Silvan Widmer, Simone Scuffet, Thomas Heurtaux, Tommie Hoban, Troy Deeney, Udinese, Watford FC, Zeljko Brkic on August 3, 2014 by franelynn.